Endoscopic ultrasound (EUS)-guided tissue acquisition has emerged over the last decade as an invaluable diagnostic tool in approaching the different pancreatic lesions. Given the safety and minimal invasiveness of this approach combined with the high diagnostic yield, it became the standard of care when dealing with different pancreatic pathologies. However, some variables regarding this procedure remain not fully understood. These can influence the diagnostic yield of the procedure and include the presence of the on-site cytopathologist, the type and size of the needle used as well as obtaining aspiration versus core biopsy, the number of passes and the sampling technique, and the role of suction and stylet use among others. We performed a comprehensive literature search using PubMed, Google Scholar, and Embase for studies that assessed these variables. Eligible studies were analyzed using several parameters such as technique and procedure, with the aim of reviewing results from an evidence-based standpoint. Background: Dental implantation is considered as one of the most widely employed procedures in dental practice. Nasopalatine duct cyst (NPDC) is one of the most common developmental cysts in the oral cavity that develops from the proliferation of embryological epithelial remnants of nasopalatine duct. Aim: The aim of this study was to highlight the development of NPDC after the placement of dental implants. Materials and Methods: A literature search was carried out in March 2015 using PubMed, EMBASE, and Cochrane library databases, searching for articles relating the development of NPDC after placement of dental implants. Results: Our search identified only four case reports of NPDC related to dental implants as reported in the literature published in English. Conclusion: Placement of dental implants can induce development of NPDCs, indicating that placement of dental implants requires well-trained specialists with perfect skills in dental implantology. Additionally, critical selection of appropriate cases is of great importance in order to avoid the development of such complications. 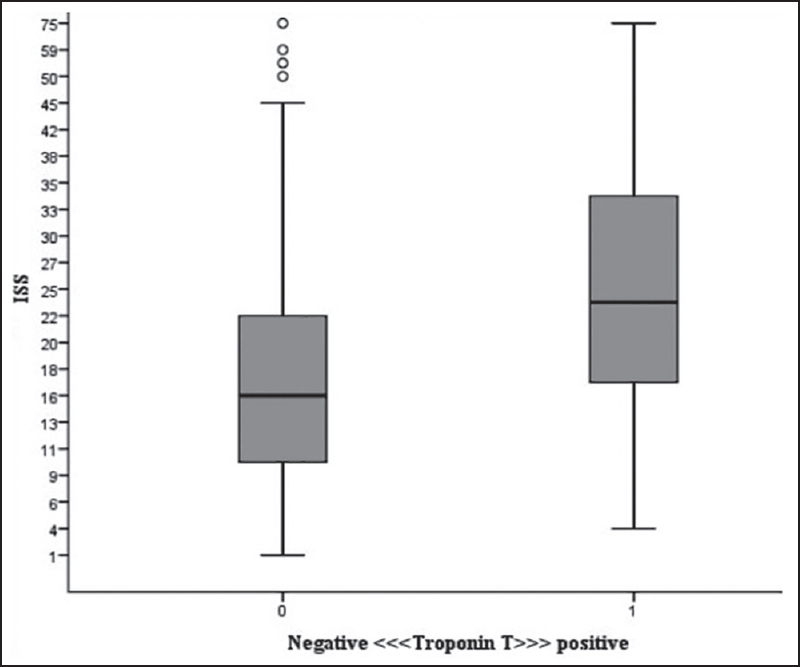 Background: Serum troponin T (TnT) is a common marker of myocardial injury. However, its implication in the absence of clinical evidence of cardiac reason is not well established. Aims: The aim of this study was to identify the implications of positive TnT in traumatic chest injury (TCI) patients regardless of the cardiac involvement. Materials and Methods: We conducted a retrospective analysis of all TCI patients admitted to level 1 trauma center between 2008 and 2011. Patients who underwent TnT testing were divided into two groups: Group 1 (positive TnT) and Group 2 (negative TnT). The two groups were analyzed and compared, and multivariate regression analyses were performed to identify predictors of TnT positivity and mortality. Results: Out of 993 blunt TCI patients, 19.3% had positive TnT (Group 1). 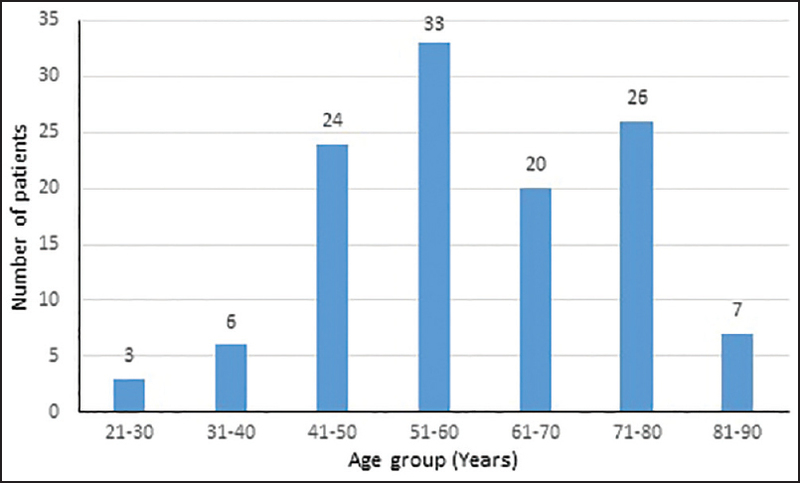 On comparison to Group 2, patients in Group 1 were 5 years younger and more likely to have head, cardiac, hepatic, splenic, and pelvic injuries, in addition to lung contusion. Positive TnT was associated with higher Injury Severity Score (ISS) (P = 0.001), higher chest Abbreviated Injury Score (AIS) (P = 0.001), and longer hospital stay (P = 0.03). In addition, Group 1 patients were more likely to undergo chest tube insertion, exploratory laparotomy, mechanical ventilation, and tracheostomy. Twenty patients had cardiac involvement, and of them 14 had positive TnT. Among 973 patients who showed no evidence of cardiac involvement, 178 had positive TnT (18.3%). There were 104 deaths (60% in Group 1). On multivariate regression analysis, the predictors of hospital mortality were positive TnT, head injury, and high ISS, whereas, the predictors of TnT positivity were cardiac, hepatic, and pelvic injuries; higher ISS; and age. Conclusions: Positive TnT in blunt TCI patients is a common challenge, particularly in polytrauma cases. Patients with positive TnT tend to have the worst outcome even in the absence of clinical evidence of acute cardiac involvement. Positive TnT is also a reflection of the severity of chest or extrathoracic injuries; however, further prospective studies are warranted. Background: Chronic urticaria (CU) is defined as urticaria persisting daily or almost daily for more than 6 weeks and affecting 0.1% of the population. Mast cell degranulation and histamine release are of central importance in the pathogenesis of CU. About 40-50% of the patients with chronic idiopathic urticaria (CIU) or chronic spontaneous urticaria (CSU) demonstrates an immediate wheal and flare response to intradermal injected autologous serum. This led to the concept of autoimmune urticaria (AIU). Aims: To determine the occurrence, clinical features, associated clinical conditions, comorbidities of AIU, and to compare this with CSU. 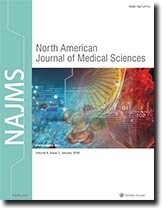 This study aimed to find the frequency of autologous serum skin test (ASST)-positive patients among patients with CSU and to identify the clinical and laboratory parameters associated with positive ASST and to compare the treatment outcome. Materials and Methods: A prospective correlation study in 110 patients with CSU was conducted, after screening 200 CU patients attending the outpatient Department of Dermatology during from January 2012 to May 2013. Patients were subjected to ASST, complete blood counts, urine routine examination, liver function tests, renal function tests, thyroid function tests (T3, T4, and TSH), and urine analysis. Results: Out of 200 CU patients screened, 90 patients had excludable causes based on detailed history and skin prick test, and the remaining 110 patients were considered to have CSU. These 110 patients were further subjected to ASST, serum immunoglobulin E (IgE), and peripheral blood eosinophilia. ASST was positive in 48 patients and negative in 62 patients. Frequency of urticarial attacks and associated diseases such as abnormal thyroid function tests in both ASST-positive and ASST-negative patients did not show any statistical significance. Only attacks of angioedema in ASST-positive individuals were higher and were statistically significant. In the ASST-positive group, 31 (81.25%) patients showed improvement with first-line antihistamines, along with oral prednisolone and injection Histaglobulin and 10 (10.41%) patients did not show any improvement. Thirty-three (43.54%) patients in the ASST-negative group showed improvement while 13 (30.62%) patients did not show improvement. Conclusion: ASST is considered a screening test for AIU, which decreases the rate of diagnosis of "idiopathic" form of CU. ASST-positive patients in addition to antihistamines, were treated with short course of oral steroids and weekly Histaglobulin injections for 5 weeks followed by the 3 rd and 6 th months. Background: Type 2 diabetes mellitus (T2DM) is a poorly controlled epidemic worldwide that demands active research into mitigation of the factors that are associated with poor control. Aims: The study was to determine the factors associated with suboptimal glycemic control. Materials and Methods: Electronic medical records of 263 adult patients with T2DM in our suburban internal medicine office were reviewed. Patients were divided into two groups: Group 1 [optimal diabetes control with glycosylated hemoglobin (HbA1c) of 7% or less] and Group 2 (suboptimal diabetes control with HbA1c greater than 7%). The influence of factors such as age, gender, race, social history, comorbid conditions, gestational diabetes, family history of diabetes, diabetes management, statin use, aspirin use, angiotensin convertase enzyme inhibitor (ACE-I) or angiotensin receptor blocker (ARB) use, body mass index (BMI), blood pressures, lipid profile, and urine microalbumin level were analyzed in the two groups. Results: In the suboptimal diabetes control group (N = 119), the majority (86.6%) of the patients were 41-80 years old. Factors associated with the suboptimal control were male gender [odds ratio (OR) 2.6, 95% confidence interval (CI), 1.579-4.321], Asian ethnicity (OR 1.4, 95% CI, 0.683-3.008), history of peripheral arterial disease (PAD; OR 3.9, 95% CI, 1.017-14.543), history of congestive heart failure (CHF; OR 3.9, 95% CI, 1.017-14.543), elevated triglycerides (OR 1.004, 95% CI, 1.000-1.007), and elevated urine microalbumin level of 30 mg/24 h or above (OR 4.5, 95% CI, 2.446-8.380). Patients with suboptimal diabetes control had a 3.8 times greater odds (95% CI, 1.493-6.885) of receiving the insulin and oral hypoglycemic agent together. Conclusions: In adult patients with T2DM, male gender, Asian ethnicity, CHF, PAD, management with insulin along with oral hypoglycemic agents, hypertriglyceridemia, and microalbuminuria were associated with suboptimal control. Background: Rheumatoid arthritis (RA) is a very complicated autoimmune disease with apparent synovial hyperplasia and cartilage and bone destruction. Aims: In the present study, we aimed to determine whether the pathogenesis of RA correlates with food allergy and which allergen(s) are relevant. Materials and Methods: We used type-II collagen (CII) to induce arthritis (collagen-induced arthritis, CIA) model in Wistar rats, and the development of arthritis was evaluated accordingly by scoring system. Proinflammatory cytokine levels in plasma were measured by enzyme-linked immunosorbent assay (ELISA), and concentrations of circulating immune complexes (CICs) were analyzed by C1q solid phase method. Furthermore, food-specific immunoglobulin G (IgG) and immunoglobulin E (IgE) levels were determined in the CIA model. Results: In the CIA model, we found that levels of tumor necrosis factor-alpha (TNF-a), interleukin (IL)-1, IL-6, and IL-17, as well as CICs, were elevated significantly. Moreover, concentrations of milk- or egg-specific IgG and IgE were enhanced strikingly in CIA rats. Conclusion: The results suggest that pathogenesis of RA correlates closely to increased egg- or milk-specific antibodies. Background: Low serum 25-hydroxyvitamin D [25(OH)D] and osteoarthritis (OA) are commonly found in patients followed up in a primary care office. Clear evidence to support the link between 25-hydroxyvitamin D levels and OA is lacking. Aim: To describe the association of serum 25-hydroxyvitamin D status in patients with OA in the primary care office. Materials and Methods: We reviewed the records of 1,455 patients seen in our primary care office between November 2013 and October 2014. All patients were older than 18 years and had a diagnosis of OA. Demographic characteristics as well as 25(OH)D levels and comorbidities were analyzed. 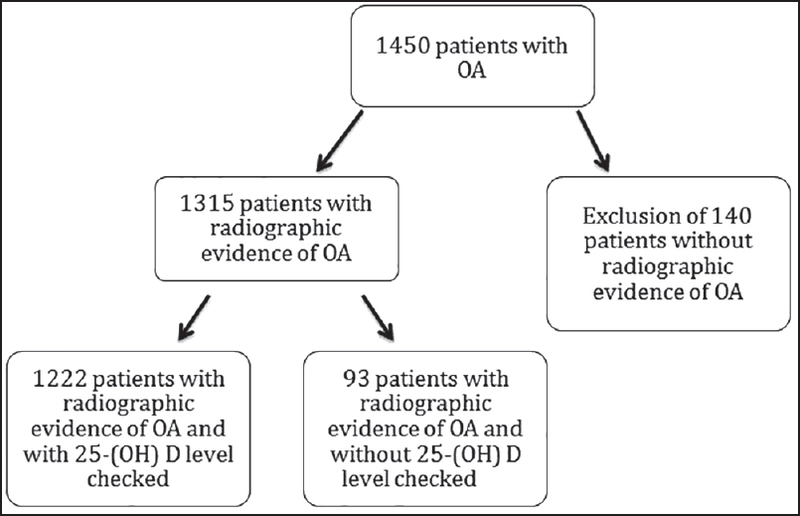 Results: Levels of 25(OH)D were available in 1,222 patients with OA. Fifty-one percent of the patients had a low 25(OH)D level. Patients with OA and low 25(OH)D were on an average 5 years younger than patients with OA and normal 25(OH)D (P < 0.001). African Americans (71.7%) and Hispanics (63.1%) had a higher prevalence of low 25(OH)D compared to Whites (42.9%) and other races (49.1%) (P < 0.001). There were significantly more smokers (15.4%) and patients with type 2 diabetes (27.6%) in the group of patients with osteoarthritis and low 25(OH)D (P < 0.001). A lower prevalence of hypothyroidism (18.5% versus 27.4%) and higher body mass index (BMI) were also noted in the group of interest. Conclusion: Patients with low levels of 25(OH)D and OA are younger than their counterparts with low 25(OH)D level. Future studies are needed to clarify the relationship between 25(OH)D level and OA. Context: Elderly patients with visual loss often have age-related macular degeneration, diabetic retinopathy, glaucoma, and cataract as common causes of visual loss. Other less common etiologies should be considered, especially in those presenting with systemic associations. Case Report: The patient discussed in our review is an 80-year-old female, with a history of diabetic retinopathy and macular degeneration who presented with a sudden deterioration of vision. While this was initially attributed to diabetic retinopathy, she was eventually noted to have a salmon patch lesion in her conjunctiva, diagnosed on biopsy to be a diffuse large B-cell lymphoma. Conclusion: Because of the significant rate of disseminated disease among patients with lymphomas in the orbit that carries a worse prognosis, early diagnosis is essential to promote better overall survival of these patients. We describe here a patient diagnosed with conjunctival lymphoma associated with pronounced visual loss and review the literature on this subject. Context: Scimitar syndrome is a congenital anomaly of pulmonary venous return where right pulmonary artery drains into right side other heart, instead of the left side, causing pulmonary hypertension resulting in shortness of breath, recurrent lower respiratory tract infections, chest pain, and fatigue. Early diagnosis and surgical intervention would correct this congenital anomaly reducing morbidity and complications in otherwise healthy young patients. Case Report: We present a case of an 18-year-old female who presented with exertional shortness of breath, fatigue, and recurrent lower respiratory tract infections. She had unremarkable physical examination but chest x-ray showed an abnormal opacity next to right heart border. Computed tomography (CT) chest was performed that showed possible scimitar syndrome. Transesophageal echocardiogram (TEE) and right heart catheterization (RHC) confirmed the diagnosis. 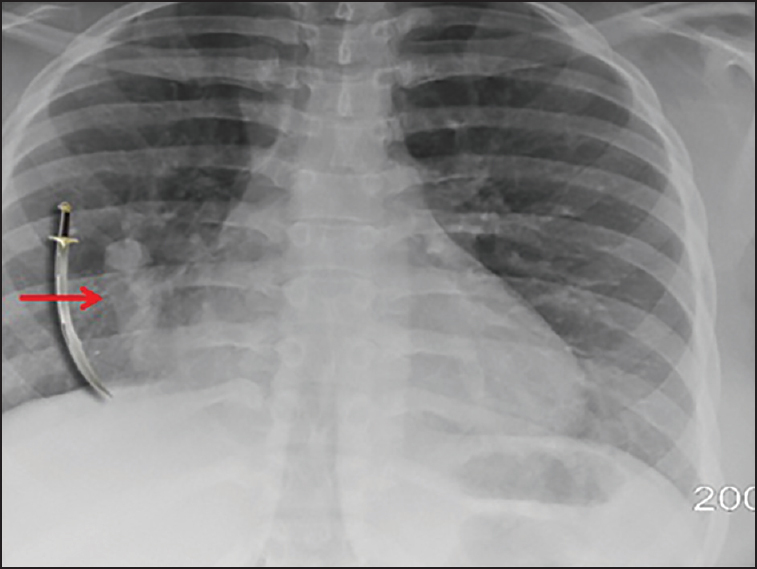 Conclusion: Scimitar syndrome is a very rare congenital anomaly of pulmonary venous return. It is usually diagnosed in early childhood but the diagnosis may be delayed until later in adulthood. The consequences are pulmonary hypertension, right-sided heart failure, and frequent pulmonary infections resulting in increased morbidity, mortality, and frequent doctor visits for otherwise healthy young patients.